That’s a question that gets asked at countless diners & restaurants across our country on a daily basis. I travel a lot for work so I get asked that question a lot. My answer is almost always the same too. I bet that’s the case for a lot of people but I would also bet that the results aren’t always the same either. It was a bad result the other day when I was in a chain restaurant that prides itself not only on their food but also on their kitschy country store that you must navigate with children on the way in & on the way out that got me thinking a little bit more about eggs. About how we order them and about how we eventually eat them. I love eggs. You can fry them, scramble them, poach them, hard boil them and soft boil them. You can just use the yolks or you can just use the whites. They can be whipped into stiff white peaks or they can be chopped into a salad or made into a sandwich . They even come in their own custom made fragile containers and if you are so inclined, you can even juggle them. My favorite way to have my eggs is fried – Over Easy with hash browns & a side of wheat toast. I love it when you poke the yolk with your fork and the yolk slowly oozes out onto the plate so you can use your hash browns and/or toast to sop it all up. While I do understand Over Medium (still dark yellow but no real ooze) and I can somewhat understand Over Hard (looks like a fried egg but acts like a hard boiled), I can’t understand the undercooked eggs I was served the other day. These eggs were lily white when they came out of the kitchen. They had no color to them at all. It looked like the chef had tried to cook them as fast as he could so he wouldn’t have to clean his pan. When I poked into the yolk it was like puncturing a water balloon and the yolk shot everywhere onto the plate at once. There was so much liquid that my hot sauce got lost and my dry biscuits (instead of toast) could barely contain it all. I wasn’t in a mood to complain and the waitress seemed nice so I ate what I could and left but it bothered me for the rest of the day. So how hard is it to cook an egg ? Let’s try and figure this one out, shall we ? Fried Eggs – Personally I melt some butter/margarine in the pan or spray with a non-stick cooking spray and then let the pan heat up to almost Medium High. When the butter starts to bubble a little I break the two eggs into the pan and hope that the whites will start to cook before they spread too far. I like to try and make sure the eggs are loose in the pan and not sticking to the edges. I’m not brave enough to try and flip two eggs at one time in the air but once I see a bubble in the yolk or see the yolk turning a deeper yellow, I slide my spatula in for the flip. I then slide the eggs back & forth in the pan a few times and before I slide them out of the pan and onto the waiting plate. I used to put hot sauce on my eggs while they were cooking sunny side up but once I started using Ghost Pepper Sauce I had to stop. My wife & kids claimed that the Ghost Pepper stayed in the pan no matter how many times you washed it so everything was becoming too spicy. 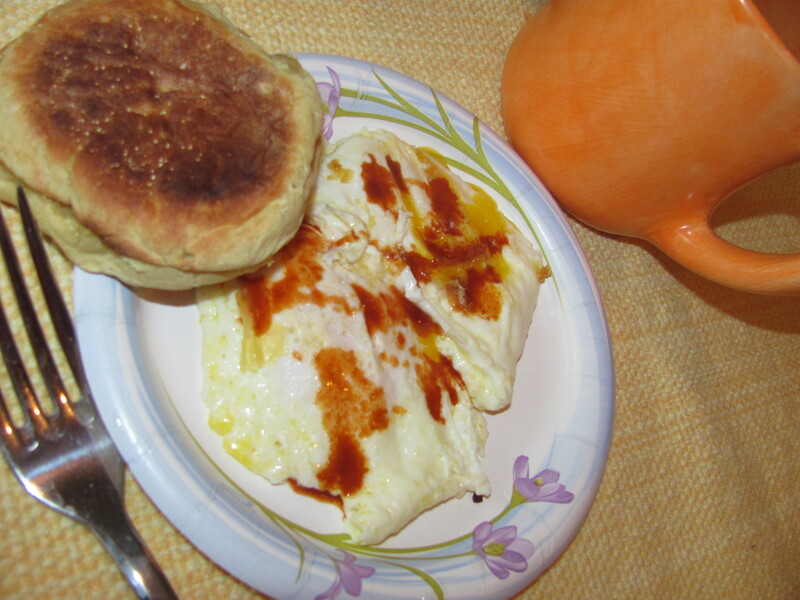 Now as you can see in the photo below, I drown my eggs in hot sauce AFTER they hit the plate. Scrambled Eggs – I have been making scrambled eggs for as long as I can remember. I used to pull the kitchen chair over to be able to see over the counter when I was younger. I loved scrambling the eggs first with an eggbeater when I was younger and now with a fork. It’s always been a splash of milk (whole, 2%, 1% – doesn’t matter – just no SKIM) and eggs whipped & mixed by hand. Pour it into a pan with melted butter and stir them so they don’t stick but not so they turn mushy. Once I moved out on my own, I started adding cheese to my eggs and now I can’t make them any other way. I prefer chunks or shavings of cheddar but I’ll use whatever cheese I can find. I do find that American is a little too creamy and that mozzarella & swiss tend to get stringy but you can work with all of them. Soft Boiled Eggs – Why ? Seriously. Why ? It’s nothing more than an over easy egg still in the shell. My Grandfather like soft boiled eggs and he tipped his toast points in them with every bite. I always thought it was ridiculous myself. I am sure that someone out there will give me a reason to re-think my position on this cooking method but as of right now, fuhgeddaboutit. Poached Eggs – I have NEVER been able to make these work for me. I keep thinking I can make a fantastic Eggs Benedict but I am kidding myself because I can never get the poached eggs to work for me and that is why when I make Eggs Benedict, they are ALWAYS Fried Eggs Benedict. Egg White Frittata – Technically not one of the classic egg preparations but it is one I do make for my wife on occasion. I sauté a mix of diced vegetables with butter and some sun dried tomato paste. I spread the veggies evenly and pour in the egg whites to cover. Then I drop in chunks of mozzarella sticks with the spices and cover while the egg whites cook. When the egg whites look done (start to solidify & bubble) and the cheese has begun to melt, I cover the pan with a plate and flip the whole thing in one motion. I haven’t dropped one (yet) and they look fantastic when served. So how do you like YOUR eggs ? I’m always open to new ideas & suggestions. And make sure to come back next time when we discuss something of what seems like relevant importance but is more likely to be trivial and not anything like we expected.